Last August (2016) My dad asked me if i wanted to run a full marathon with him! I casually said yes, thinking it would be lovely to have some one on one time with my dad, we can train together for 8 months and then run this marathon like pros. Let me start with the back story, my Dad started running 2 years ago, having never run before in his whole life. He actually wrote a book (on Amazon!) about starting running, as he wanted to document how someone can go from a non-runner to completing a marathon. He said he thought of me a lot when running, about giving to charity (breast cancer) because of me and how thankful he was that I was ok now, and how it clears his mind when he runs. I remember when he started training for his first marathon I had recently finished the London to Brighton bike ride and was missing a challenge. I asked him if I could do it with him and he said no, it was something he wanted to do on his own. This first marathon was 2 years ago in Scotland, the Loch Ness marathon and I could not sit still all day, I was so worried and stressed for him. When I got the notification that he had finished, tears streamed down my face uncontrollably. I was just in awe of him, how can someone run 26.2 miles? To me it was just mind blowing. He went on to do marathon after marathon in the coming months – it was incredible, he was incredible. So the day he asked me if I wanted to join him on this journey I was so excited, This was soon to change! We arranged to meet the following week and go for a short run (5 miles). I had never run more than 5k before and even that was only for race for life and I walked most of it. We met up and immediately started running (this was later to be a thing with my Dad…. never a warm up). We ran across Boxmoor in Hemel Hempstead then towards Berkhamsted, past one of my favourite pubs the Winkwell, then turned back towards home. My muscles hurt like never before, my lungs were burning and I got blisters. It was a summers day and I felt the fear, what have I signed up for? In the coming months I joined a gym and did “couch to 10k” 3 times a week, to try and get to the standard that my Dad seemed to think I was already at. I was desperately hoping each gym session would make the weekly run with Dad easier… it never did, his runs just got longer, faster and bigger hills! A classic was meeting Dad at 9.10 at the church, only to get on a bus that took us 19 miles away to Aylesbury. Then we ran back, I had to phone my Mum at 2pm and beg her to collect my son from school as I would not have made it in time. Dad planned the routes, I never really knew where we were going on our runs or how hilly they were going to be, it frightened me so much. Along the way I had many setbacks, the first was Christmas, just overeating and laziness plus childcare issues to add to the mix. But most of my set backs were injuries, bad ankles, terrible hip pain on my right side, lost toe nails and sickness. By the time the Marathon day came I was all in, 8 months training was so hard, being a single parent and having Trending Hair to run, was hard enough but to throw in so much training was chaotic and very stressful. There was no way I was letting anything get in my way. So I got up on the 15th April 2017 at 5.05am, left the house at 6.20am, my lovely boyfriend drove me and my son to Northampton where I met my Mum and Dad, we checked in and got our numbers at 7.30am. We started at 9am. All along Dad had been telling me he will wait for me, that we will do this together. Well, mile 1 I lost him, I was busy trying not to be sick every few seconds (I think it was the adrenaline) and Dad was ahead lost in the crowd of proper runners! I found him at about a mile and a half, where he was running on the spot waiting for me… come on Bev’s, down hill now, run fast, (this was Dad all over) all the time in training he would say, just round this corner Bev’s its down hill, Just over this hill Bev’s its down hill, Just down this lane Bev’s there’s a cafe to stop and rest (none of them were ever true). So I ran the first lap, each lap was 4.3 miles, you had to run back into base to get your ticket stamped then leave to do another lap, we had to do 6 to make the full marathon distance. We got back into base, I filled up with water and got my ticket stamped and Dad said let’s go. I was devastated, all the training and hours I had put in and I felt like I did not want to leave base again. I left and followed Dad, for some reason I kept getting the lines “just keep swimming, just keep swimming” from Finding Nemo going around and around my head! I kept running and the second lap we were still within the time (we had only 6 hours to start the final lap). So many different emotions went through my mind that day, happiness, a calm, sickness, pain, fear, anger, self doubt, self worth. I thought about friends, family, lost friends and lost times. I thought about the future, about the following day, about that evening, after having a bath and being clean sitting on my sofa with my pj’s on thinking I did it, I really did it. But I remember at 21 miles, thinking we are not going to finish this. I was to slow to get in the 6 hours and I had hit a wall, everything was telling me to ring the bell at base and give up. I did the maths over and over in my head, time wise it was so close, so close that I relaxed into it and thought I did my best, if I don’t come in on the 5th lap in time to leave then that it’s fate and I did my best. I entered base desperate for the toilet, desperately hungry and needing my water bottles filled up, I only had 9 minutes to get my card stamped, get a drink and leave for the last lap. I was almost hysterical with pain in my hip, my legs felt so weak and I needed the toilet so bad, but as I left base for the last lap i realised, no matter what, I was going to complete this marathon. I had beaten the clock and got out of base before they stopped the clock. I finished the Marathon, with money being donated to Breast cancer. I was last to finish. 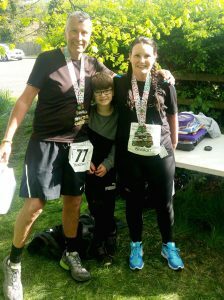 Well, I would have been except Dad let me run ahead of him – the first time I managed to overtake him in the 26 miles. I had an amazing time, I write this the day after the marathon and I am in so much pain, I’m exhausted, but so proud of myself. What type of hair extensions?